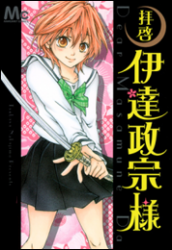 Synopsis: Tamura Aki is a maniac when it comes to historical things and she especially loves Date Masamune. Therefore, when she meets for the first time Hashiba Masaki, who happens to have a bandage on his right eye, just like Masamune, she believes that he´s her destined love. Hashiba-sama, as Aki calls him, is a rather violent guy that fights with his fists some yakuza-like fellows. How will she be able to get close to him in this kind of a situation?